The #2019 Hot Wheels #Speed Blur #’92 Mustang Super #Treasure Hunt seems like its been a long time coming. Why, you ask? Well, we will get to that in just a moment. First, I wanted to address the new #Spectraflame Paint that has been used on the 2019 supers. It really is reminiscent of the spectraflame from the classics line. With that said, have we ever seen a spectraflame aqua like this before? It shines like no other, and adheres to every nook and cranny of the casting, accentuating the contours at every angle — I am a fan! Typically, I try to avoid buying supers (of the castings I don’t collect) online as it only fuels the rage at retail, and I can get better quality cars for the money. I’ll admit I was touched by the “gotta-have-its” though as I was enamored by this paint when it first started to show up. That wasn’t the only reason, though. This 2019 #Speed Blur release also appeared to be the long-lost, “super-ized” version of the infamous 2012 Treasure Hunts series release. The #’92 Mustang was released as a Treasure Hunt before — in 2012. That was the first year supers were “hidden”, ending their 5-year reign as the second-tier of the annual green-striped #Treasure Hunts series. 2012 was the lone year (since the start of the super era in 2007) that regular treasure hunts had their own series. After that, the regulars were “hidden” too –eliminating the infamous green-stripe that designated the series — so they could be placed in other segments. As you can see, the #’92 Mustang was part of that 2012 Treasure Hunts series — in aqua! So while the fans of this fox body #Mustang casting were certainly disappointed they didn’t have a super-ized centerpiece for their collection, they can certainly rejoice now as both #Speed Blur variants fill the void quite nicely. The #Speed Blur #’92 Mustang started appearing in the #2019 Hot Wheels “G” case assortments, and is the Super #Treasure Hunt for that case code. The regular Treasure Hunt for the “G” case is easily the best one this year (so far) in the #Super Chromes Corvette Stingray. To see the rest of the #2019 Treasure Hunts, make sure you check the OTD 2019 Treasurue Hunts Tracker. The #’92 Mustang is one of two fox body #Mustang castings that Hot Wheels currently produces — with the second being the ’84 Mustang SVO. 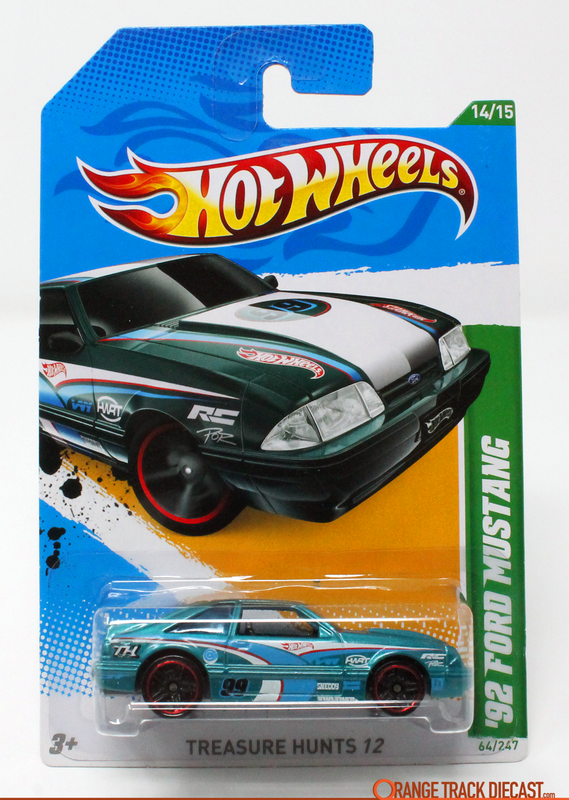 The ’84 has only been released in premium lines, and can be seen head-to-head with the Super Treasure Hunt ’92 Mustang, below. I may have started with my admiration for the #Spectraflame Paint on this release, but I am going to end by talking about the wheels and the tampos. We have seen a resurgence of the #Real Riders LW5 Wheels (via the mainline) as they have been used on two Super #Treasure Hunts this year. Before that, the RRLW5 wheels had mostly been used in premium lines — only appearing on the Super Treasure Hunt ’80 El Camino in 2011 — since they started showing up on Hot Wheels 10 years ago. Its unclear what sparked the change, but they do fit this casting quite nicely, and I could get used to seeing them in the mainline. Super #Treasure Hunts tend to look a heck of a lot better than their common variant counterparts because of three things: paint, wheels and added tampos. This super hits on all three points as you can see the comparison above and below. I am still floored by this spectraflame aqua paint and I truly hope we see it again. The wheels — while they certainly aren’t among my favorites — do fit the #’92 Mustang quite nicely. Lastly, the added tampos on the hood and spoiler, really complete this retro-looking, #Speed Blur design by Hot Wheels graphic designer, Leeway Chang. re: lw5 real riders, what about the 2011 ’80 el camino super in gold and black? Thank you, Joe! I knew there was at least one that had them. I looked through the wiki last name and did not see any though, but now I see that they were labeled incorrectly on there. Thank you again, updated article. I long to find that $TH ‘Stang in the wild! You say it’s a new finish for Spectraflame? Well, I think it looks awesome, with that bright, vibrant finish.. the way a $uper should look. That TH Corvette looks good too next to that ‘Stang .. two icons from the 70’s & the 90’s! Nice, nice!